Earlier this year we hatched out two sets of eggs in our incubator. The first round included eggs we bought from breeders, the second round was for eggs off of our flock. We hatched out 13 of 15 eggs that were either full Black Copper Marans or Black Copper Marans crossed with Ameraucanas. Of the 13 chicks, NINE ended up being roosters... we only got four girls out of the bunch! Luckily these are dual purpose birds (Ameraucanas usually are just egg layers, but crossing them with big BCM birds results in a larger bird adequate for dual purpose use). Once this baby flock was big enough to protect themselves, we started free ranging them everyday. It helps conserve feed if they can forage for most of the day. 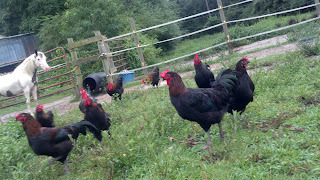 They are now 16 weeks old and the roosters are ready for processing. We call it "going to freezer camp". It isn't a pleasant idea, but at least they can serve a purpose.